What Are Corporate Tax Cuts Doing to Wages? There’s no end to the insanity. Our central bankers and politicians are trying to keep this artificial bubble going at all costs. How shortsighted. How arrogant. How selfish! These politicians will be roasted in history, not just for creating the greatest bubble ever, but for extending it far beyond any logic. I said in 2016 that no matter who gets elected, the musical chairs will stop between 2017 and 2020. This current administration will not be re-elected. The Republicans look likely to lose the House, possibly the Senate, and there hasn’t even been a crash or downturn yet. So, you can see why Trump would want to have extra insurance going into the mid-terms this year, and the presidential election in 2020. One tax cut that heavily favored business profits, and the top 1% to 10% that tend to own them, was not enough. I know many of our subscribers own businesses, and we naturally want such tax cuts (including me). Corporations and businesses don’t need any tax cuts, let alone more. There are a number of reasons we’ve had the greatest income inequality in the last century, and perhaps ever. But this is the primary reason: wages and salaries, as a percent of GDP, peaked in 1970 at 51.7% and fell dramatically to 42.1% in late 2011. That’s a fall of 29%. Wages – from 1945 to 1974 – in the last great boom and bust averaged around 50% of GDP. They were more stable and hence no extremes in income inequality or stock crashes greater than 20% happened during the Bob Hope boom from 1942 to 1968. Corporate profits took a hit in the inflationary 1970s and into the early 1980s. But since 1986, they’ve gone straight up from 4.2% of GDP to 10.1% in late 2011. They’re still at 9.4% currently. That’s an increase in their share of the economy by 141%. 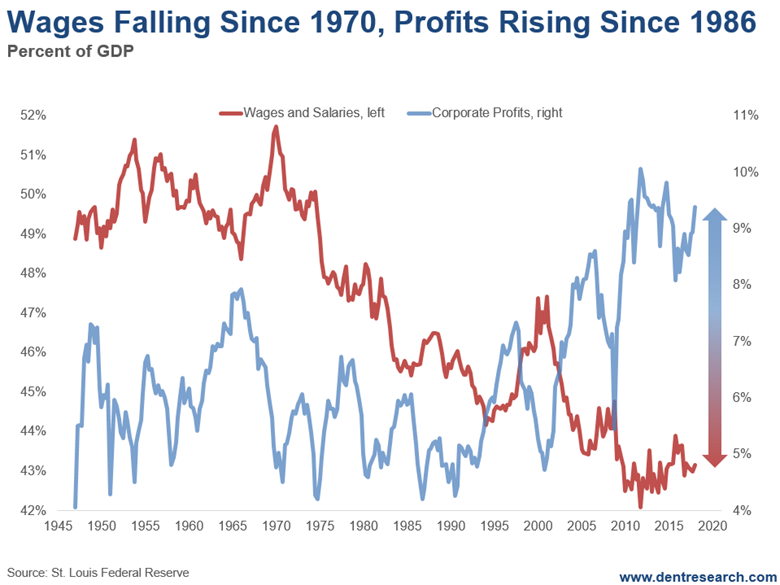 So, wages go down 29% since 1970, and corporate profits go up 141% since 1986. How do you like them apples? Trump shrewdly appeals to the most disgruntled workers (and for good reason) by telling them he’s going to “Make America Great Again” – by curbing immigration and bringing good jobs back. Then his first major policy is to give one of the greatest tax cuts in history to businesses, which are overwhelmingly owned directly or through stock by the top 1% to 10%. They’re the ones who have gotten pretty much all of the wage and wealth gains in the past decades! It would be one thing if companies were struggling and needed more capacity, yet they don’t. Capacity utilization has been between 75% and 78% in recent years, but 80% to 85% is more normal. Companies will continue to buy back their stock (a practice that just spiked to new record levels in the first quarter), and create mergers and acquisitions that just rearrange the pie but don’t accrue to everyday workers. More typically, these result in layoffs. That’s what they have, and will again, get most rewarded for.